A search for the name Faisal Shahzad on the social networking site Facebook brings up 673 results, many featuring profile images of men with the same skin tone and hair color as the man who admitted to authorities he left a car bomb in New York's Times Square Saturday night. Shahzad was arrested late Monday night aboard a flight to Dubai even though authorities say they placed him on the U.S. no-fly list earlier that day. His arrest again shines the spotlight on the list - one of the government's most public counterterrorism tools since the Sept. 11, 2001, attacks - and how the government tells the difference between suspected terrorists and people with similar names and physical appearances. After all, as CBS News Reporter Farhan Bokhari reports from Islamabad, Pakistan, both Faisal and Shahzad are fairly common names Pakistan, where Shahzad spent months before returning to the United States. Adding more people to the list could make Americans safer when they fly. But it could also mean more cases of mistaken identity. The process starts with a tip, a scrap of intelligence, a fingerprint lifted from a suspected terrorist's home. It ends when a person is forbidden to board an airplane - a decision that's in the hands of about six experts from the Transportation Security Administration. 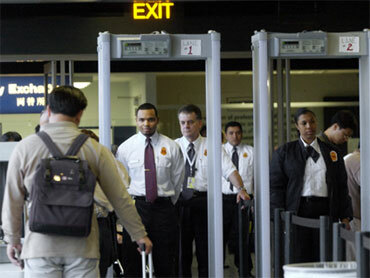 The no-fly list they oversee constantly changes as hundreds of analysts churn through a steady stream of intelligence. In the aftermath of Shahzad's arrest, the government is now requiring airlines to check no-fly lists within two hours of being notified of list updates. It could take minutes to put a name on the list. Or it could take hours, days or months. Current and former intelligence, counterterrorism and U.S. government officials in March provided The Associated Press a behind-the-scenes look at how the no-fly list is created. They spoke on condition of anonymity to discuss sensitive security issues. Despite changes over time, the list remains an imperfect tool, dependent on the work of hundreds of government terrorism analysts who sift through massive flows of information. The list ballooned after Sept. 11 and has fluctuated in size over the past decade. In 2004, it included about 20,000 people. The standards for getting on the list have been refined over the years, and technology has improved to make the matching process more reliable. •	It begins with law enforcement and intelligence officials collecting the smallest scraps of intelligence - a tip from a CIA informant or a wiretapped conversation. The information is then sent to the National Counterterrorism Center, a Northern Virginia nerve center set up after the Sept. 11 attacks. There, analysts put names - even partial names - into a huge classified database of known and suspected terrorists. The database, called Terrorist Identities Datamart Enterprise, or TIDE, also includes some suspects' relatives and others in contact with the suspects. About 2 percent of the people in this database are Americans. Analysts scour the database trying to make connections and update files as new intelligence flows in. The next tier of analysis happens at the Terrorist Screening Center, another Northern Virginia intelligence center, staffed by analysts from federal law enforcement agencies across the government. •	About 350 names a day are sent to the Terrorist Screening Center for more analysis and consideration to be put on the government-wide terror watch list. This is a list of about 418,000 people, maintained by the FBI. To place a name on that list, analysts must have a reasonable suspicion that the person is connected to terrorism. People on this watch list may be questioned at a U.S. border checkpoint or when applying for a visa. But just being on this list isn't enough to keep a person off an airplane. Authorities must have a suspect's full name and date of birth as well as adequate information showing the suspect is a threat to aviation or national security. •	Once armed with information for those three categories, about a half-dozen experts from the Transportation Security Administration who work at the screening center have two options. They can add a suspect to the "selectee list," a roster of about 18,000 people who can still fly but must go through extra screening at the airport. Or, if analysts determine a person is too dangerous to board a plane, they can put the suspect on the no-fly list. The names on each list are constantly under review and updated as the threat changes. In 2007, officials removed people who were no longer considered threats. Some were inactive members of the Irish Republican Army, a former law enforcement official said. And in 2008, the criteria was expanded to include information about young Somali-American men leaving the U.S. to join the international terrorist group al-Shabab, the senior intelligence official said. If a person on the no-fly list dies, his name could stay on the list so that the government can catch anyone trying to assume his identity. At times, officials have allowed passengers to fly even if they are on the no-fly list, the former law enforcement official said. In some cases, this is to let agents shadow suspected terrorists while they're in the U.S. Before this happens, FBI agents and TSA experts consult with each other. If it is decided a suspected terrorist should be allowed on the flight, he and his belongings might then go through extra screening, he might be watched on camera at the airport, and more federal air marshals might be assigned to monitor him during his flight, the former official said. How Close was Shahzad from Getting Away?